Northwest Peaks Scenic Area offers secluded recreational opportunities and scenic views of the upper West Fork Yaak River drainage and a panoramic view of the surrounding area. Mountain peaks reach to heights of more than 7,700 feet. 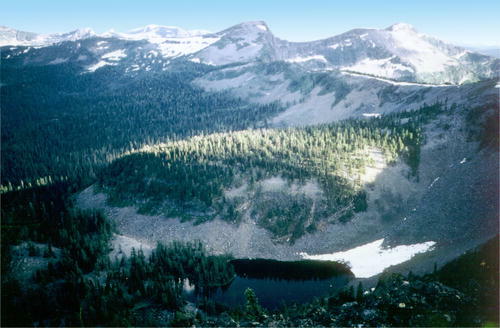 19,100 acre Northwest Peaks Scenic Area, part of the Kootenai National Forest, is located in the northwest corner of Montana close to both the Canadian and Idaho borders. The Northwest Peak Trail offers scenic views of the upper West Fork Yaak River drainage and a panoramic view of the surrounding area at its crest with primitive recreational opportunities. 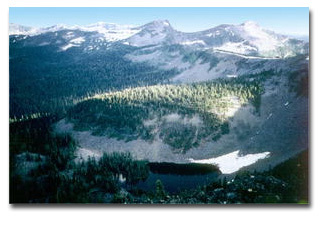 Part of the Selkirk Range, the area contains alpine forests, lakes and rocky mountain peaks with elevations that reach to heights of more than 7,700 feet. The Forest Service cautions that the trail and unpredictable weather at high elevations limit access during early and late season. Northwest Peaks photos by Rick Kerr II. Kootenai Forest map by the Kootenai National Forest.